Scan-Speak Discovery drivers are produced and engineered in Denmark, but at much more attractive prices. This system uses the long stroke 12" subwoofer 30W/4558T. This woofer features a rigid aluminum cone with rubber surround. The 12.5mm linear excursion ensures good control at very low frequencies. 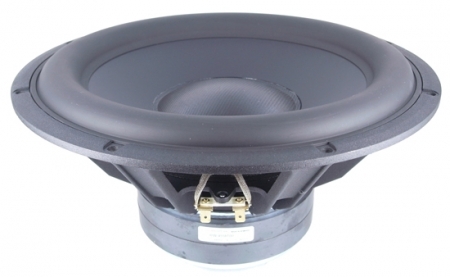 A 2" diameter voice coil provides good power handling and fast response. The large magnet provides good efficiency and tight control. Scan-Speak subwoofers make great replacements for old drivers in a variety of audio gear and are also fantastic for new designs. Hi-tech fiberglass/ paper cones combine natural warmth and sound quality with superb detail. Large vented magnet assemblies and extended voice coils enable long-throw performance and strong bass. These versatile subs are also rugged enough to be used in dipole and automotive infinite baffle applications. Blending the 30W Kit into your stereo system is a breeze thanks to the Speaker Power line of subwoofer plate amplifiers. SpeakerPower has over 30 years experience designing and manufacturing loudspeakers and amplifiers for some of the biggest names in the business. 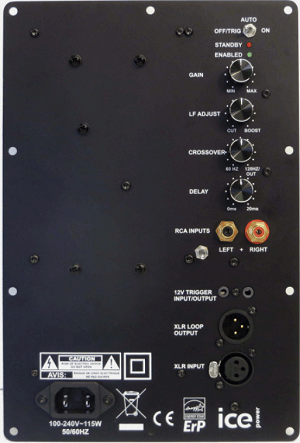 So while piecing together your own amp may appear to be less expensive, when you consider the total cost of time to market, UL/CSA, inventory, engineering etc you will find the SpeakerPower turnkey solution to be very competitive.